Over Training! The Reason You Are Not Making Gains In The Gym! home » Over Training » Over Training! The Reason You Are Not Making Gains In The Gym! You have tired everything including changing your routine around, eating more protein, adding more sets, less sets, sleeping more each day if possible but still you have come to a dead end. This is not an uncommon problem and is faced by most people at one time or another who workout at the gym on a regular basis. Sticking points will happen and adjustments must be made if you want to keep progressing until you have reached you full genetic potential. I have noticed in the many years I have been weight training that some people seem to never make any gains. Year after year they look the same and train the same and than complain about their lack of progress but won’t take it upon themselves to make the changes needed to get the gains going again. So what is the answer to all of this? The answer is so simple most people who train don’t believe it could possibly be this easy! So what is the answer you might ask? It is one word my friend! REST! Why this seems to be such a difficult thing to grasp is beyond me! Weight Training is not rocket science. People make this more difficult than what it really is. The simple fact is that if your body is not recovered from the pervious workout and you go back into the gym before it has than you won’t make gains. The body only has a limited amount of reserves in which to draw on and once it has used those reserves up it is gone and can only be replaced by rest and recover. Think about the gas in the tank of your car for example. Once the gas is gone in the tank the car won’t run again until it is refilled. While this may seem like a stupid example to some the point here is that only rest will refill your body’s tank and nothing until than will help it. Over training also leads to other questions about how much should you train to begin with in order to avoid these pitfalls? Do yourself a favor! Don’t read bodybuilding magazines. If you are a hard gainer and are not using drugs, these magazines filled with pictures of juiced up bodybuilders will only make things worse for you if you are not gaining in the first place. I don’t want to get into a debate on which training routines are best but the insane amounts of time pro bodybuilders spend in the gym is just crazy. They train five and six days a week in the gym and two to three hours at a time. The only way they can maintain this life style is by taking a boat load full of steroids. I am not here to judge them but for the average gym rat just wanting to improve their looks and their health this is not the way to go. Being able to weight 300 pounds at 6% body fat is the kind of genetics most people don’t have to being with. Steroids will only enhance what you were already born with. If you are currently at a sticking point and are not making gains I would suggest taking some time off of about two weeks to give your body a break by getting away from the gym for awhile. It is a lot harder not to go to the gym than it is to stay out of one! Most people think they will lose strength if they stay out of the gym more than a week or so. Decompensation or the loss of muscle mass and strength actually takes weeks or even months to occur. So let rest be your friend and not your enemy! However you decided to train weather it be one day a week or five or six or seven you need to keep a record of each training session! Remember the old saying of “If you fail to plan you plan to fail”!Well this holds true in this situation. Keeping track of your workouts is the key in knowing weather or not you are making gains on regular a basis. Writing down the workout before you go to the gym is the only way to go. Record the type of exercises you will be doing and the amount of weight you will use for each exercise. During the workout be sure to record the number of reps you were able to do for that exercise. Even an increase of one rep from the last workout will show an increase in strength. Keeping records will be the gauge you need to show if you are making gains or not. If you find yourself at a stand still than I would add a day of rest in between each workout to help to insure you are getting enough rest. Keep adding days in between workouts if necessary till you get the gains going again. Staying with this method will insure continual gains in the gym. Also something else you can try along with this is to cut back on the number of sets you are doing. If say for example you are doing 5 sets of bench presses cut it back to 3 sets. Drop some exercises from you workout. Instead of doing squats and leg presses both on the next workout drop the leg presses! As you get stronger from one workout to the next you are placing more stress on the body with the increase in weight you are using. An increase in stress means that the body will need more time to recover and when you need more time to recover you need to take more days off between workouts. I currently train once every 7 to 10 days and I make continual gains each and every workout. This might sound crazy to those of you who train 6 or 7 days a week but with the intensity of my training I need these days of to make sure I recover. Besides, at 55 years of age I find that this method works best for me to not only insure my recovery but it also helps in protecting my joints from excessive wear and tear! 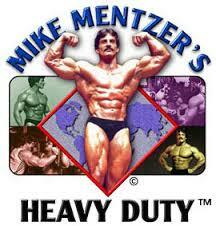 If you are totally lost on where to start and if you are looking for a new way to train than my suggestion to you would be to read books by the late Mike Mentzer at www.mikementzer.com. High Intensity Training in my opinion is the most productive and safest way to train. I am not saying that other methods don’t work but from a bodybuilding stand point I don’t think anything else comes close when it comes to getting results like you can get with High Intensity Training. I’ve never regretted training this way and I don’t think you will either!